I love that description - "fluent fool." And boy have I been foolish sometimes. But why do we stumble so often? Communication is one of the biggest challenges in domestic business. Companies spend millions of dollars on training, consulting, software and other tools to facilitate and streamline communication. And yet, with a shared "American English" there are frequent breakdowns. Not only are there colloquial differences, but each person is different, and our language skills, listening ability and assumptions/biases create breakdowns. I know, that's a no brainer you say. OK, I agree. But why then do we think that finding someone who "speaks English" suddenly simplifies international business? Sure you can have a pleasant conversation, but the very basic cultural differences which are "hardwired" from birth mean we use language differently, and experience it differently. And that's even before accent and other technical differences. The importance of accent was driven home for me one time walking through one of the largest production facilities in the greater Mumbai area. I had worked in India for several years and was quite comfortable with accent and language differences. Nevertheless, during this factory tour, one of my Indian colleagues literally had to "translate" the English - English conversation between me and the General Manager of the facility. So profound were the differences in our accents that we simply couldn't understand each other. Of course, by definition, that is impossible. But with experience you should certainly be able to intuit when you are approaching the limits of your real cultural & langauge competence, and similarly anticipate when your counterpart is too. 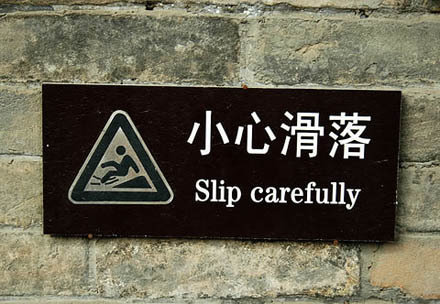 Tread very carefully. "Backbrief" obsessively - this sounds like "OK, let me recap what I understand you are saying" and then do so in different words. Or even more effectively "I want to make sure we have the same understanding. would you mind quickly recapping for me what we have discussed?" Early in your international business adventure you will make mistakes. And if you "circle back" frequently you'll avoid costly misunderstandings. But learn from them, and listen to advice of others who have similarly stumbled. It's understandable and you'll be easily forgiven. But if you blithely charge ahead without sensitivity and awareness you will compromise your international program and likely make expensive and frustrating mistakes. You don't have to speak foreign language to do international business, but you are a fool if you don't understand that complications inherent in cross-cultural and language assumptions. At Consilium Global Business Advisors we can help you identify that point when you are crossing into areas in which you are likely to stumble. Our experienced advisory services help to structure international business development programs which accelerate market entry and reduce costs and risks.